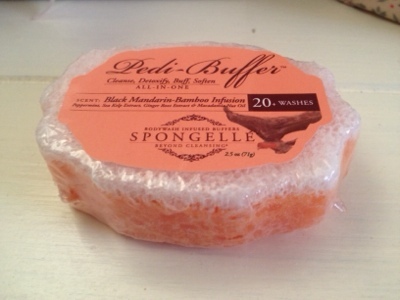 A quick blog post this evening I couldn't let the evening pass without posting immediately about the amazing Spongelle ireland pedi buffer. It has been a long time since I was this quickly impressed with a product. So with the gorgeous weather today my feet were in my sandals for the first time this year and after the day I was embarrassed to look down and see the absolute state of them! I've got 7 weeks left of my pregnancy and to be fair haven't seen my feet in a while so I allow myself a slight bit of leeway but I then remembered about the pedi buffer I've been threatening to use for the longest time. It has a soft side for cleansing and a buffing side for exfoliation. I'm actually so glad I kept it until now and I have fallen in love, it straight away eased my achey feet and made me feel like I was in the middle of a luxurious pampering session. Not only did it feel amazing but it has dramatically reduced the terrible look of my feet and made them look and feel human again. Excuse the yucky feet pics but they must be included for the sake of blogging! You can clearly see the dramatic difference in the amount of dry skin between both! The pedi buffer has 20 uses and I already know I am going to wear this right out. This is an absolute summer feet essential everybody ( especially pregnant ladies) should get themselves one. The pedi buffer retails at a very reasonable €12 and is available from Spongelle ireland - studio wax drogheda and a number of stockists nationwide.